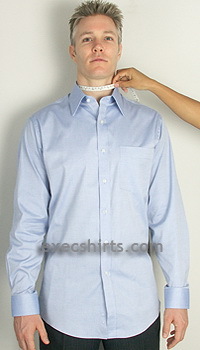 Place the tape measure at the base of your neck (where the collar meets the shirt) measure the distance to the point where your buttocks ends and your legs begin. 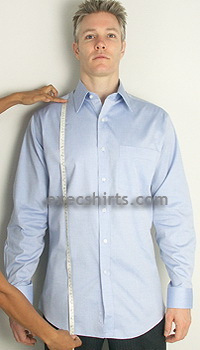 This is the typical length of a custom dress shirt. Round up your measurement to the nearest full inch. Place the tape measure around your hips at the part where your hips extend the farthest. Add 2 inches to the measurement. Round up your measurement to the nearest full inch. 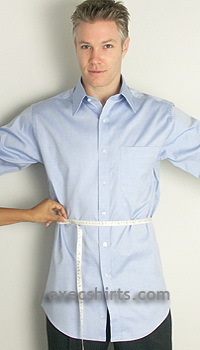 Your shoulder measurement is the distance between the outer edges of each shoulder (shoulder seam). Take the measurement and round up your measurement to the nearest half inch. With your arm remaining straight at your side, and your hand slightly curled, measure the area from the outer edge of your shoulder seam to the first knuckle of your thumb and subtract 1 to 1 1/2" depending on how long you like your Sleeves. Record to the nearest half inch. 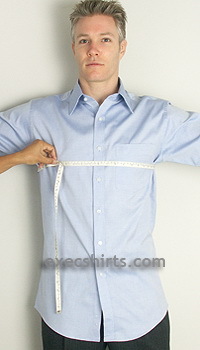 Place the tape measure around your neck where the top of the collar goes. The tape measure should be flush with your neck, not too loose and not too tight. 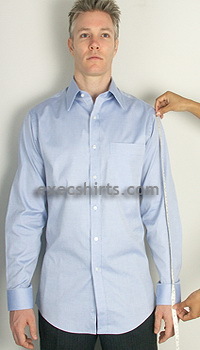 If you like the neck on your shirts to fit loose add 1 inch; If you like the neck on your shirts to fit snug, add 1/2 inch. Round up your measurement to the nearest quarter inch.